The city of Johannesburg, Gauteng, is home to a number of historical and cultural landmarks that visitors can explore this Heritage Month. 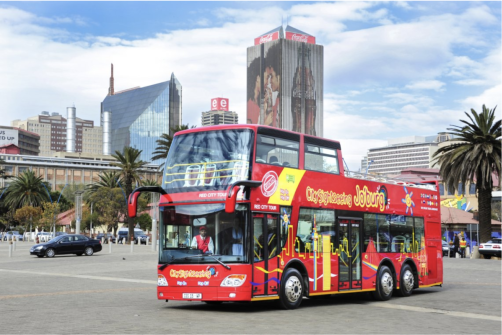 The City Sightseeing red bus allows visitors to visit some top cultural landmarks with the 2-Day City Tour and Soweto Combo. The Orlando Towers in Soweto were constructed between 1935 and 1955 as a coal-fired power station. In 2008, the towers were opened as an extreme sports site and the world’s first bungee jump between two cooling towers. They have since become a tourist-drawing landmark with activities such as bungee jumping. Their power swing offers a 40m freefall before the swing cables kick in. Hop off the red bus at stop 14 for a visit to the Apartheid Museum in Ormonde in downtown Johannesburg, near Gold Reef City. This museum was opened in 2001 and depicts the apartheid story through interactive displays, as well as films and historic photographs painting a picture of South Africa’s road to democracy. The building structure resembles the prison conditions of Robben Island, where Nelson Mandela was imprisoned for 18 years. Hop off the red bus at Constitution Hill (stop 5) to explore South Africa’s Constitutional Court precinct. The country’s highest court is located at the former prison complex where many political prisoners were jailed during the apartheid struggle. This site was constructed in 1893 as a prison for white men and later, briefly, as a military fort. Additional sections were later added to the site, including a section for black male prisoners, known as Number Four, a Women's Jail and an Awaiting Trial Block. Some of the famous people who have served time here are Nelson Mandela, Mahatma Gandhi, Joe Slovo, Albertina Sisulu and Winnie Madikizela-Mandela. Today the site is a living museum documenting South Africa’s body of law and endorsing the rights of all citizens. Stop 15 on the City Sightseeing red bus route is at the SAB World of Beer in Newtown Here, visitors get to explore the role of beer in African culture. A combined beer tour and tasting allows you to learn about the rich history of South African Breweries through its museum. Expect to taste traditional African beer (umqombothi), and learn about the history of beer making in Africa and across Europe. Parents travelling with kids can also pop in at the Sci-Bono Discovery Centre just a quick walk from the SAB World of Beer. The centre offers innovative and dynamic learning experiences, with a focus on maths and science. 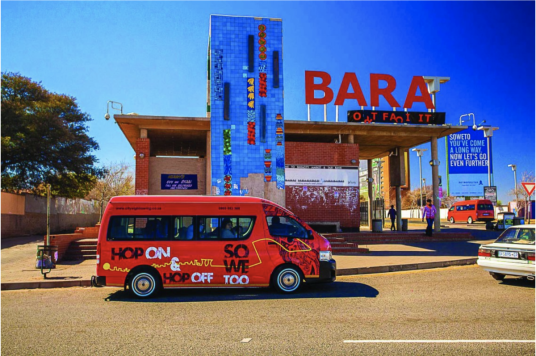 Passengers on the Johannesburg City Tour can switch to the Soweto leg of the tour (by minibus) at Gold Reef City Casino Hotel (stop 13).The two hour long Soweto tour allows passengers on the red bus to visit this famous township south of Joburg for a rich and vibrant interactive experience. Vilakazi Street is among the most visited places in Soweto. The street has been home to two Nobel Peace Prize winners – Nelson Mandela and Archbishop Emeritus Desmond Tutu. This part of Soweto is also home to two museums, the Mandela House Museum, just a short distance away from the Hector Pieterson Memorial and Museum. Vilakazi Street is always buzzing with life and vibrancy – from the local cuisine to the different languages spoken in the area. Sports fans and football lovers have the opportunity to hop off the red bus and visit the FNB Stadium, South Africa’s largest stadium, in Nasrec, Soweto. With a capacity of more than 87 400, the FNB Stadium is regarded as the heart of football in South Africa. A number of important historical events have taken place in this venue, as well – such as the first mass rally after the release of Nelson Mandela in 1990. In 1996, the stadium played host to the Africa Cup of Nations final, where South Africa beat Tunisia by two goals to zero. In 2010, it hosted the first and final matches of the 2010 FIFA World Cup. Global music superstars, including U2, Lady Gaga and Justin Bieber, have also graced this stadium with their presence.